Christmas is around the corner. By now, the shopping rush is at its peak. Malls are packed. Car parks are full. People are ramping up purchases regardless of how slow the economy is. Christmas carols and festive songs are played over the airwaves about Santa Claus, reindeers, gifts, and of course the famous words, “Peace on earth and goodwill to all men.” Modern consumers generally let these songs remind them of shopping time and the coming end of the year festivities. Few would bother to pause and ponder at the words of the classic carols. In fact, some of these traditional carols were written not with modern hypermarkets or big box department stores in mind. They were written with a grim message of seeking hope amid the gloom. A) Peace on Earth, Goodwill to All People? One of these songs is the haunting 19th Century carol called, “I Heard the Bells on Christmas Day.” Written by Henry Wadsworth Longfellow who lost two wives and had a son injured during the war, when he hears songs about peace and goodwill, those were words he could not identify. His third stanza is an honest confession of his inner conflict. And in despair I bowed my head: "There is no peace on earth," I said, "For hate is strong and mocks the song Of peace on earth, good will to men." Longfellow is not alone. Some people dread Christmas for various reasons. It might be missing the presence of a loved one who recently passed away. It could be the absence of a family member who could not come home for the season. It could also be due to illness or some unforeseen circumstances that render family get-togethers impossible. Someone I knew from Church recently died in a tragic car accident. He was hit by a speeding car on an early Saturday morning. His family was left reeling in utter shock and disbelief that he could not be present with the family on Christmas. In times like these, we would rather the festive season be over as soon as possible. For every occasion of family togetherness reminds us of the tragic loss of a loved one. How can one celebrate Christmas when one’s love is no longer around? It is hard. Painfully hard. As I think about the first century Bethlehem, the coming of Christ was during a period of hard times too. Joseph, engaged to be married to his fiancée, had to grapple with the shame of being married to a pregnant woman. He could legally divorce Mary, but was told not to. Then there was the evil King Herod who was so paranoid about the words of the Magi about the coming “king of the Jew” that he ordered the killing of all boys two years and under in Bethlehem. Joseph and Mary too had to escape to Egypt to avoid Herod’s brutal genocide of baby boys. There was no Santa Claus to give presents then, only Roman soldiers ordered to kill. There were no nice hospital beds with advanced medical care for Mary, only a humble manger for Mary to rest and give birth.Just like Longfellow's carol, peace and goodwill are much hoped for but scarcely realized during the year of Jesus' birth. B) A Superimposed Peace and Goodwill? Seen in this light, I tend to shudder when some church performances superimpose modern conveniences and contemporary Christmas symbols on the nativity scene. There would be cute looking donkeys, furry sheep, and smiling cows all surrounding Joseph and Mary. 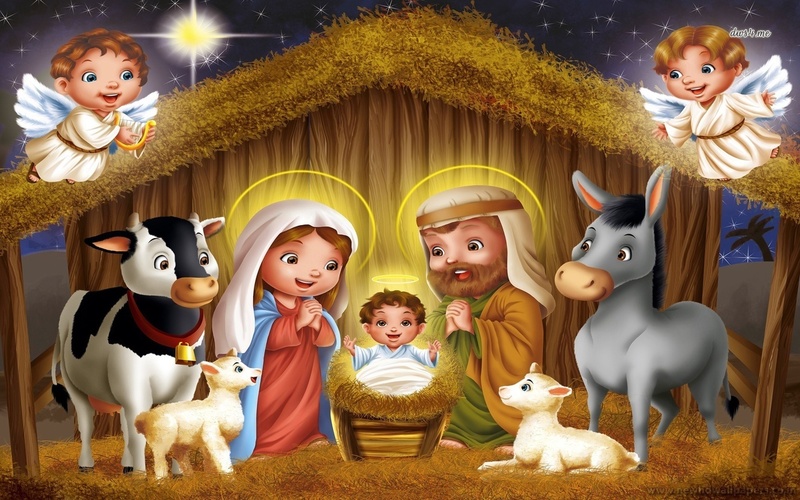 There would be a clean shed, a nice crib, elegantly dressed Mary, and a proud looking daddy Joseph. With twinkle stars above, looking on would be angels fluttering above with wings and the three magi queueing up to offer their gifts. In reality, first century Bethlehem was no Hollywood play. For most of us, we too superimpose the joys of Christmas with three different modern versions. The first superimposed version of Christmas is none other than material gifts. I have seen many places that celebrate the happiness of Christmas with Secret Santa parties and gatherings. Schools would ask their students to prepare a gift not more than $5-$10 and have it nicely wrapped for a gift exchange. Friends tell one another to bring along a special gift to a party to be distributed at random to guests. Churches also participate in making hampers, providing gifts for other poorer communities, and so on. All of these center around material goods. The underlying belief is that it is better to give than to receive. Not much to argue there, except to ask: Are our giving actually meeting the needs of the needy? What if one does not like the gift obtained during Secret Santa gift exchange? What if one already has three of the same gift at home? What if the supposedly needy people did not need another teddy bear or canned food, but real hugs and good nutritious food? While it is good to give, it is not good to give indiscriminately without considering the real needs of our recipients. The second superimposed version of Christmas is family. With turkey dinners and Christmas trees to brighten up the faces of children, Christmas to many North American families means a time where family come together for simply "family time." The TV movies say it all. Each year, Hallmark TV channel releases several Christmas themed movies. This year is no different with 12 brand new Christmas themed movies. All of them center around good feel family reunions, reconciliation of relationships, romance, and snow flakes falling like confetti to create the magical Christmas spirit. On a cold and dark Winter season, such movies are like hot chocolate to warm the heart. Family moments are essentially the purpose of such Christmas themes. Christmas as a family theme completely replaces the birth of the Son of God with humanistic renditions of what it means to have a good time. The third superimposed version of Christmas is human pursuit of happiness. The song "Jingle Bells" has a phrase that says: "Dashing through the snow, In a one horse open sleigh Over the fields we go Laughing all the way." Popular with kids, "Jingle bells" is a song widely played at shopping malls frequented by adults. As I watch people rush their last minute shopping and the racking up of debt to be paid by January, I am not exactly sure if will all be worth it. Money is the currency of happiness. This also means the lack of money will lead to the decrease of happiness. Last week's article on what it means to be spiritually rich has more information on the alternatives to such humanistic pursuits of happiness. Unlike the worldly offerings that treat Christmas either as a humanistic perspective or a secular manner, the Bible shows us that peace to the world is connected to bringing glory to God. It is a proclamation of praise to God. The words "Glory to God in the highest and on earth peace to men on whom his favor rests" were uttered by angels at the birth of Jesus Christ. This is also called the Gloria in Excelsis Deo, which means in Latin as "Glory to God in the highest." The angels were declaring it outright when Jesus was born. The Christmas carol, "Angels We Have Heard on High" rightly proclaims this angelic chorus. It is a declaration of God's glory in the highest that once God is lifted up, true peace will come to earth and goodwill be extended to all people. I am reminded of the powerful Pauline phrase: "He is before all things, and in him all things hold together." Christmas carols is about lifting up the name of Christ and the glory of God to be declared throughout creation. Such a mood is larger than all the shopping madness. It is much more fulfilling than all the turkey stuffings in the world combined. Peace on earth is not about the absence of trouble but the presence of God. Let me close with a story which I shared at a sermon last Sunday. Once there was a king who held a competition inviting artists throughout the kingdom to participate. A prize would be given to the winner who can paint the ultimate portrait of peace. After looking through the hundreds of entries, the king eventually shortlisted two. The first was a beautiful picture of a serene lake, surrounded by majestic mountains, and lush greens on the sides. With clear blue skies and beautiful colours, it was the crowd's favourite. Everyone clapped their hands and nodded their heads with approval when the king stood in front of the first portrait. When the king approached the second painting, he paused, and spent a long time observing the details. It was quite similar to the first scenery, except that the lake was not as still. The mountains were not as pretty and the skies are much darker with angry clouds signalling a storm about to arrive. There was also a raging waterfall. Suddenly, to everybody's surprise, the king immediately proclaimed the second painting as the winner. The decision stunned the crowd into silence. The king then said that he chose the second painting because of one thing. Behind the dark clouds, stormy lake, and furious waterfall was a mother robin nursing its young inside a crack behind the waterfall. When one is peaceful inside, nothing outside can shake you.